Are you thinking of buying your first home in Iowa? Would you like information on programs available in Iowa – some include a free gift of money – to help you purchase that first home? If you answered yes to these two questions, there is great news for you. The state of Iowa provides several programs for its residents and need help with the down payment and closing costs. This money comes in the form of state, county and city grants and incentives. This is free grant money that shouldn’t be passed up! The program value and grant awards can be in the thousands of dollars. It will be well worth your time to educate yourself about the programs that the State of Iowa provides. The agency in Iowa that provides assistanceis the Iowa Finance Authority. There are several programs available, depending upon the program and your income. 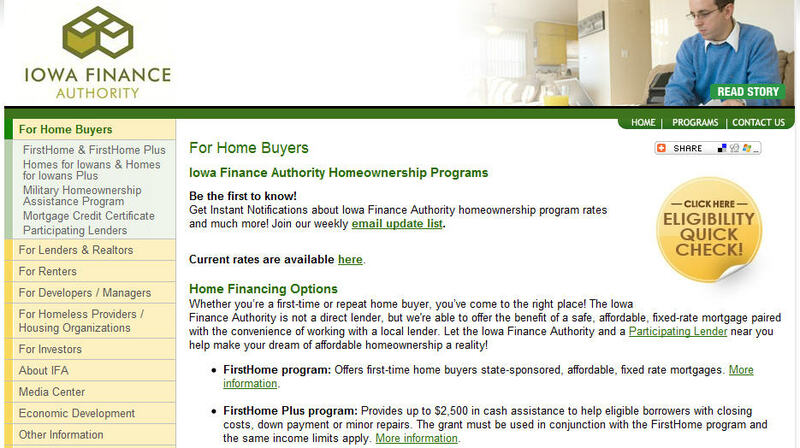 To find out which grant programs you may qualify for and how much is available with each, please visit the Iowa Finance Authority website page specifically describing all the home buyer programs. 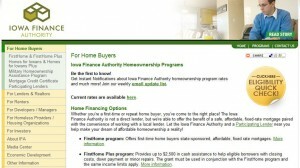 The Iowa Finance Authority’s FirstHome program offers first-time home buyers state-sponsored, affordable, fixed rate mortgages and the convenience of working with a local lender. The Iowa Finance Authority’s FirstHome Plus grant provides cash assistance to help eligible borrowers with closing costs, down payment or minor repairs. The grant must be used in conjunction with the FirstHome program and the same income limits apply. 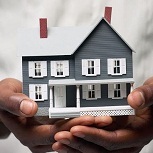 In addition to the grant programs described above, the U.S. Department of Housing and Urban Development provides home buyer assistance and programs in every state. There are multiple grant programs designed specifically for people that meet certain requirements, such as grants for people with disabilities so they can continue to live independently at home. It is worth visiting HUD’s website to see what assistance is currently available. For your convenience, simply go to this page. “With the Algona Housing Assistance Program low and moderate income persons can receive up to $5,000 towards the down payment or closing costs of a single family residence. 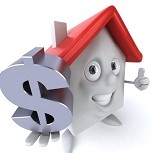 You don’t need to be a first time home buyer. You just need to be purchasing a single family residence in Algona and meet our income guidelines. With this program we can help you get that home! “The mission of the Community Development & Housing Assistance Division is to expand the choices available to the public in order to improve their quality of life. 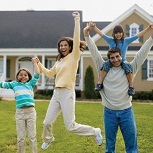 “More than 1,350 individuals and families have purchased a home through our DREAM Homebuyers Program. More are doing so every week! “Low and very-low income families interested in purchasing a home under the ADHOP program must complete and submit the ADHOP application. Applications will be date and time recorded when they are received by Housing Authority. Selection of participants shall be made in order of receipt, subject to eligibility and preference criteria. The family must be able to make a minimum down payment of $500. The selected family must make a payment of $250 in earnest money prior to the Housing Authority scheduling an appraisal. This earnest money is applied toward the down payment, if financing is approved, or refunded if financing is not obtained. 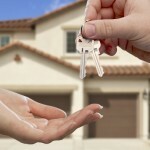 How do I find out more about Homeownership Programs? “The Oskaloosa Housing Department operates the Oskaloosa Housing Trust Fund. These programs offer different housing opportunities and solutions for residents of the city. “The Housing Assistance Center is located on the first floor of City Hall in Room 107. The Housing Assistance Center staff consists of 6 housing analysts, one inspector, two administrative secretaries, and a manager. Their primary responsibility is the administration of federal affordable housing programs funded by the Department of Housing and Urban Development (HUD). HUD calls an agency that administers their rental assistance programs a Public Housing Authority (PHA). This entry was posted in Down Payment Assistance, First Time Home Buyer Grants, First Time Home Buyer Info, First Time Home Buyer Programs and tagged Affordable Dream Homeownership Program. Bookmark the permalink.